Sue and I went to the park in my car today, as we needed to collect hers from the garage immediately after the parkrun. Our encasement in metal was just as well, as we could shelter from the rain in the car before the shower stopped, conveniently at ten to nine. The course was actually quite dry, much to my surprise, and on the warm morning it was a very pleasant outing, particularly as I decided to jog slowly until the final kilometre, so that I won’t be too tired for the 10km Tatton Yule Yomp tomorrow. The lowest turnout since March, of 174 participants, was a reflection on the weather that greeted us this morning. Four of those who were in attendance were Victor and Franciska and their two children, shown above with Victor unfortunately hidden behind Franciska, who finished well inside 29 minutes (over 8 minutes behind Victor) despite the handicap of having to push a buggy with two children in residence. This would be their final parkrun here, as they are imminently returning to live in Amsterdam. We wish them well and do hope to see them on an annual visit. Turning the other way, as we headed off for a coffee, we watched the runners continue to pour in to the finish. Later, this is a view of the Bridgewater Canal in Sale, in between showers. There’s lots of graffiti in Berlin, not generally up to the high standard set by Valparaiso, but some of it is quite artistic and much of it is on the bits of wall that have been left as a monument. Many messages are conveyed through the different artists responsible for the graffiti. However, the picture above, painted on a new (post wall) building just behind the posts that mark the position of the wall – they are in the foreground – is a most evocative portrayal of the manner in which the wall cut through the meat of Berlin between 1961 and 1989. The graffiti below simply brightens up a dull concrete block of flats. It was only yesterday that we gathered outside a nice café for this group picture with Lauren. It seems longer ago than that! I’ve spent the day doing ‘house admin’, including taking Sue’s car for its final service by the main dealer before its first MOT. “Do you want a valuation?” is their script. “No thanks, valeting inside and out will be fine” is my standard response. I’ve still got to sort out the Berlin photos, but our walk/cycle up the road from the hotel to the bike shop/pub (we went up and down a few times) passed the water tower shown below. Ulrich thought it was the home of the very first ‘Concentration Camp’, but the extract from Wikipedia that I’ve inserted after the picture seems to indicate that the camp was in an adjoining building. The Wasserturm Prenzlauer Berg is Berlin's oldest water tower, completed in 1877 and in use as a water tower until 1952. The structure was designed by Henry Gill and built by the English Waterworks Company. It is situated between Knaackstraße and Belforter Straße in Kollwitzkiez, in the Prenzlauer Berg locality of Berlin (part of Pankow district) and worked on the principle of using piped water to supply the rapidly growing population of workers. Below the storage tank were the homes of the machinery operators who worked in the tower; these apartments - a landmark of Prenzlauer Berg - are still inhabited and in much demand. An adjacent machine hall was the first concentration camp in Nazi Germany in the first half of 1933. That building was demolished in 1935. Meanwhile thanks go to AlanR for solving my ‘image size with mobile blogging’ problem. ‘Send reduced’ is indeed the answer, though it took a Utube video to show me how it works, and I think all the pictures will have to be selected at the same time, or they finish up in different postings. There may not be any mobile postings for a couple of months, so I hope I can remember how to do it when the time comes! It’s a shame that Samsung have taken a backward step on this front. Today's 16 km ride was in the company of Lauren, a South African lady who has lived here for the last five years. 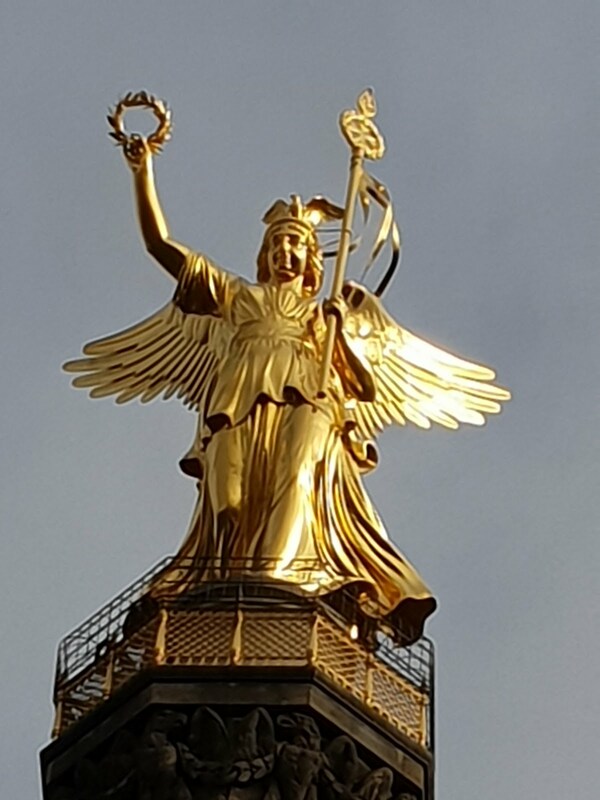 She takes time off from writing a book about Germany (see daytradersberlin.de), to guide tourists on bicycles around some of the city's sights, concentrating on 20th century history and The Wall. It was a lovely clear morning, if only a shade above freezing. The four of us were joined by three other guests for this informative tour, courtesy of berlinonbike.de. central memorial of the Federal Republic since 1993. The place is full of very recent history. Added interest was provided by Ulrich, who was a student here shortly after the wall came down. 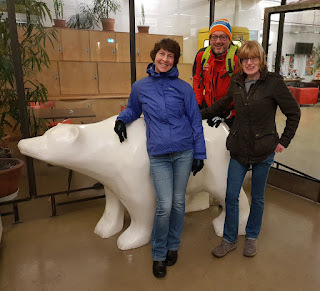 The guided tour lasted about four hours, after which Sue and I waved off Anne and Ulrich, collected our things from the hotel, wandered around a Christmas market, enjoyed afternoon tea and cake, and made our way back to the airport. An enjoyable little trip in good company. More photos when I get time to post them. Well, it was a bike ride in what used to be East Germany. We started, on our 'sit up and beg' hired, solid and very heavy bikes, with a 7 km bike ride to a railway station where we caught a train to Oranienburg. Coffee and cake were then required as it had reached 11am. En route I'd noticed from the train that all private residencies were securely fenced, so a road like ours at home, where anyone can walk up to any front door without even having to open a gate, would have fences and gates at the boundary of each house. "For privacy" explained Ulrich. I expect there's a historical element that has generated a need for privacy. Whilst '1984' may not have occurred in the UK, perhaps it did here. A short ride then led to Sachsenhausen. There's a large site of free to enter museums here. The place was a large Concentration Camp and apparently the site of 'Head Office' of the Concentration Camp regime that dates back to 1933. There were lots of visiting groups. We had a quick look round, but you could spend a whole day here. Horrific treatment of human beings occurred here. We used cycle paths to get to Bernau via Liebenwalde. 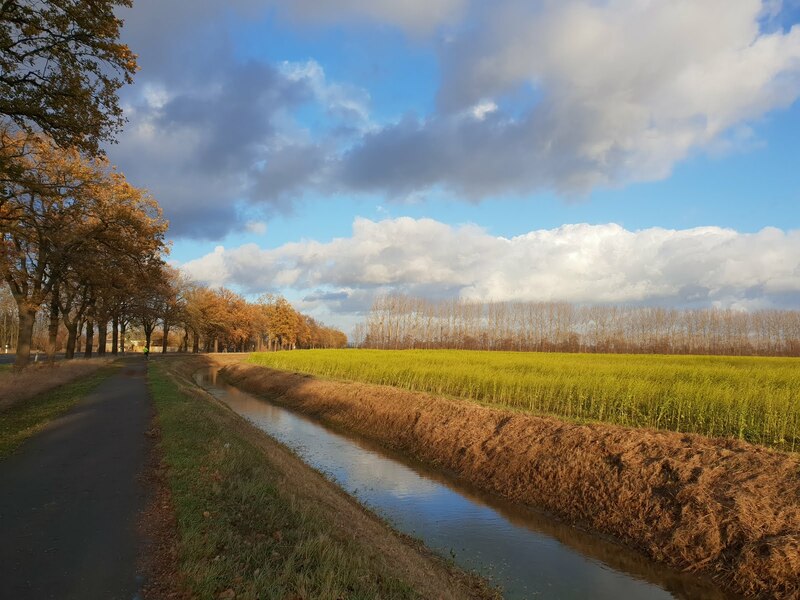 There was a 'shoe tree' and an ornate totem pole, as well as a short section of scary main road, otherwise it was a pleasant ride through flat farmland interspersed with pine forest and small villages. Today's picture was taken here. We passed several buzzards, one of which was standing on a mole hill in a field full of mole hills, presumably waiting for its dinner to appear. Luckily we finished the 57 km loop on cycle paths. Just as well, as darkness fell. 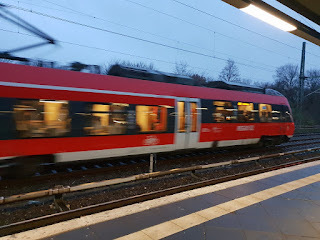 From Bernau, after grabbing coffees and chips from a café, we took a couple of trains to get us close to the Transit Loft. Total distance cycled for the day was 66 km, compared with about 35 km yesterday. Ulrich and Anne then cycled off again to rendezvous with another of Ulrich's old mates. Sue and I chose to stay away from our saddles and stroll down to San Marco's for beers and pizzas. Hired bikes facilitated a tour of the city, culminating with a visit to the DDR museum, where the exhibits are usefully labelled in English whilst rather unhelpfully being hidden in cupboards. It started rainy, then the sun came out. We had a coffee and cake break in a supermarket, despite there being a nice looking café nearby! The others went up a West German tower. I stayed down and was entertained by a van driver who managed to hook her vehicle onto the tow bar of the vehicle ahead. The top of the tower is today's picture. Later, we went to another traditional East German pub, where we enjoyed a good meal with a couple of Ulrich's old mates. He used to live here. I've been unable to work out how to reduce the sizes of images attached to emails, hence yesterday's problems, so currently I'm stuck with one image per posting. It was simple with the S5 but I've no idea as to how to reduce an attached image to 10% of its original size using the S9. Here's the original text of a failed message. I'm struggling with mobile blogging using this new phone. It was a wet day in Timperley. We chose to move to a different country. Door to door to the Transit Loft (not 'Lounge') took nearly eight hours, so no daylight pictures were available here. We have followed in the wake of Anne and Ulrich, who arrived yesterday and were watching Katie Archibald win an Omnium race (UCI Track World Cup) whilst Sue and I were puzzling over platforms. A magnificent steam engine roared through one of the stations, giving me no chance to grab a camera. The modern express pictured today seemed to be travelling comparatively slowly. Dinner at a traditional hostelry rounded off the day. Here we are tonight. This is a test posting.